York is a highlight for any visit to Britain — by far the best stop between London and Edinburgh. 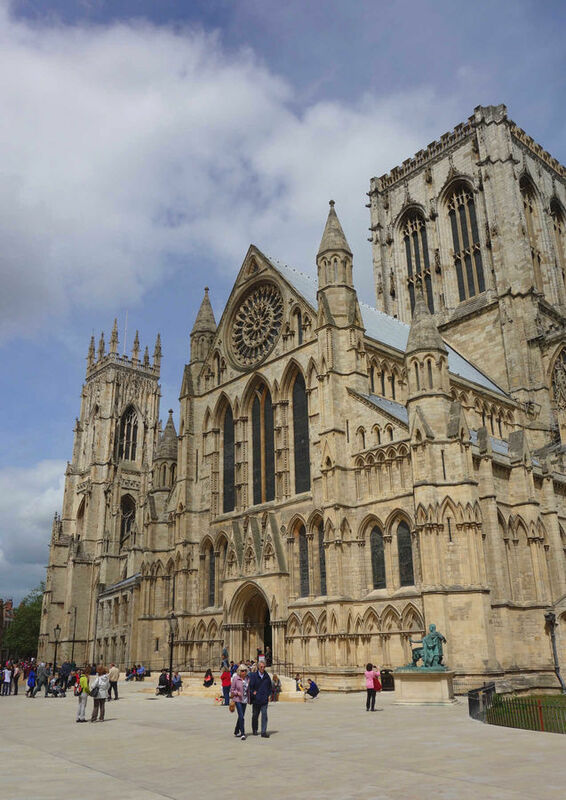 While full of fantastic sights, the pride of York is clearly its cathedral, the York Minster, the largest Gothic church north of the Alps (540 feet long, 200 feet tall). Splashed with stained glass and graced with soaring ceilings, this dazzling church brilliantly shows that the High Middle Ages were far from dark. The city's first church was built in 627, and the town became an early Christian center of learning. The Vikings later took the town, and from the 9th through the 11th century, it was a Danish trading center. After the invading and conquering Normans destroyed, then rebuilt the city, medieval York grew rich on the wool trade and became England's second city. When Henry VIII, in his self-serving religious fervor, destroyed nearly everything in England that was Catholic, he spared the great York Minster. Henry needed a northern capital for his Anglican church. To fully experience the cathedral in musical action, go for an evensong service (held most evenings at 5:15, no offering plates or sermon). Arrive early and ask to be seated in the choir. You're in the middle of a spiritual Oz as 40 boys sing psalms — a red-and-white-robed pillow of praise, raised up by the powerful pipe organ. You feel as if you have elephant-size ears, as the beautifully carved choir stalls — functioning as giant sound scoops — magnify the thunderous, trumpeting pipes. If you're lucky, the organist will run a musical victory lap as the congregation breaks up. The Minster is also famous for its 15th-century stained glass, especially its Great East Window, which is the size of a tennis court. The window's fine details, far too tiny to see from the floor, were originally intended for God's eyes only. But these days a Minster visit includes an exhibit about the painstaking, years-long conservation project that wrapped up in 2018, featuring interactive computers that let you zoom in on each panel, read about the stories depicted in them, and explore the codes and symbols hidden in the window. The Minster's octagonal Chapter House was the meeting place of the cathedral's governing body. The fanciful carvings decorating the canopies above the stalls date from 1280 (80 percent are originals). The parade of stony faces — each with so much character and personality — provides a sense of what society was like 800 years ago. And the undercroft museum, accessed through the Minster's south transept, takes visitors back even farther in time, focusing on the history of the site and its origins as a Roman fortress. Visitors can view actual remains of the Roman fort's basilica through a see-through floor, and glimpse patches of Roman frescoes from what was the basilica's anteroom. If you're a fan of church bells, you can experience ding-dong ecstasy Sunday morning at about 10:00 and during the Tuesday practice session between 19:00 and 22:00. These performances are especially impressive, as the church holds a full carillon of 35 bells (it's the only English cathedral to have such a range). How big of a deal are the bells? When the church let go of its bell-ringing staff after some internal disagreements in 2016, it was national news. On my last visit a deacon led me up stairs halfway up the bell tower and we came to a room — vacant except for a fat lifeless rope hanging from the ceiling. Like a kid, the deacon began pulling the rope. As he reached and reached, pulling ever higher and ever lower, I readied my ears for a thunderous ding dong. Suddenly he clenched the rope and soared high above me and clanging rang throughout the town. Back on the medieval wooden floor he winked at me and said, "In York our bell is so big it rings the ringer." 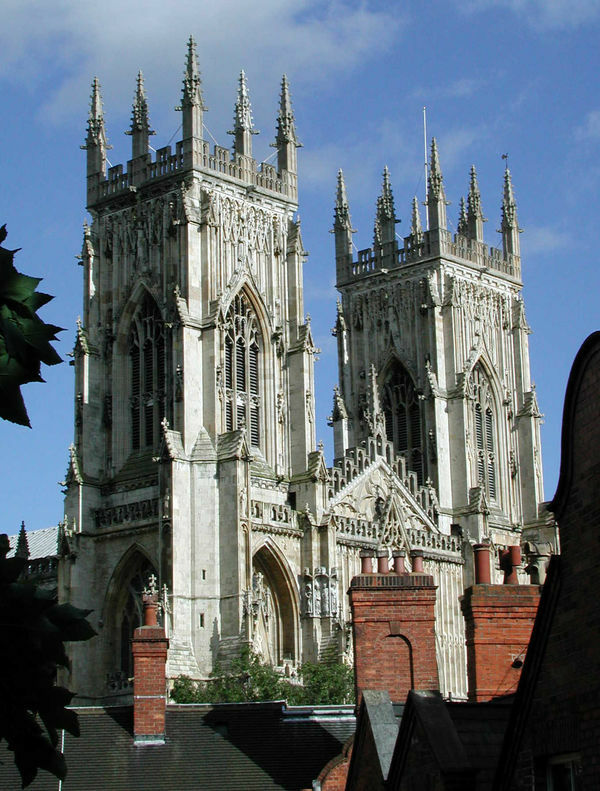 The majestic Minster is reason enough to make a stop here, but York offers plenty more reasons to stay at least a few nights. 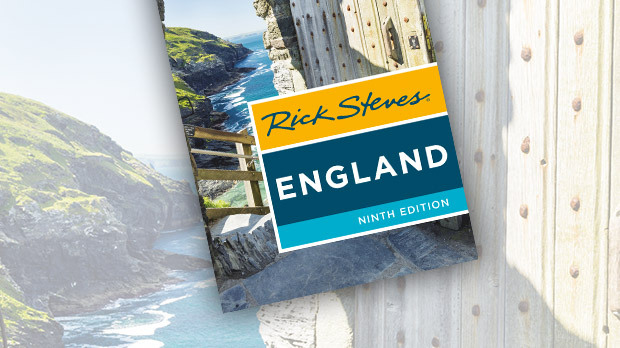 It seems like everything that's great about Britain finds its best expression in this manageable town. With its strollable cobbles and half-timbered buildings, grand cathedral and excellent museums, thriving restaurant scene and welcoming locals, York delights.